Running With Horses: Playlist of the People! A few weeks ago I downloaded a podcast of a marathoner round table and listened to it while traveling. There were some really good discussions, but what struck me was a runner's comments on the "pro" side of the music-while-running debate. He talked about the advantage of pace and motivation in the playlist, which I have found to be what works for me as well. He then mentioned how in his last marathon he had his wife and children select the songs and voice record a private message. What a great idea! My music has worked for me over the past few years, with very little change. It's time for a major mix change. So, I returned home and immediately asked the girls to think about the song that I would include on the list for next month's Chicago Marathon. They took this seriously and I appreciate the thought they put into finding the songs that will keep me going. 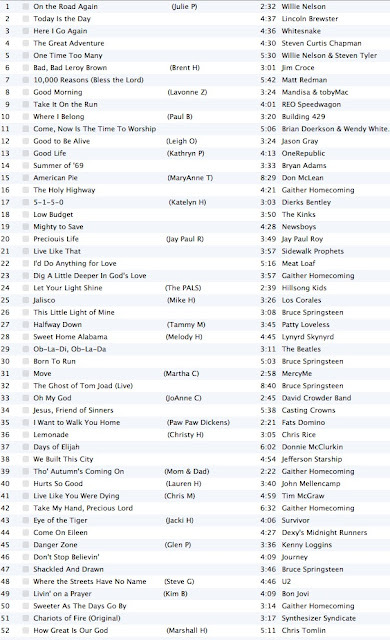 Next, I decided to kick it up a notch, and make this a true "Playlist of the People". I asked facebook friends and family to suggest songs to help motivate and/or meditate. Songs that bring back old memories and those that are sung as prayer requests for the person, or family, making the request. 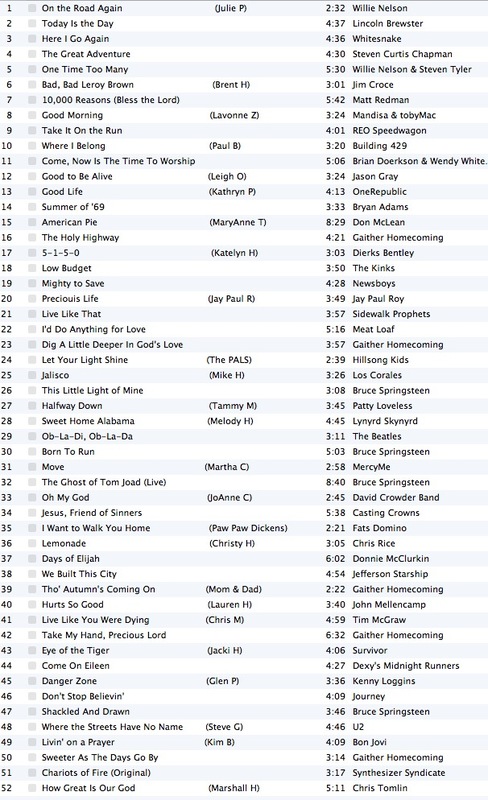 Attached is the playlist following this online solicitation. I also want to invite anyone that is a regular to Running With Horses to join in the fun. Give me your story and a song. I'll see what I can do to work it in (I've even sacrificed some of my tried and true Springsteen, so you know this is a big deal). I would like nothing more than to run Chicago with all of you, and if you can't be there in two weeks, at least you will be running along on the playlist! By the way, my youngest came back with 5-1-5-0 Somebody Call the Po-Po (you just have to love my little country bumpkin). My oldest, the '80s queen, thought that Hurts So Good would provide some classic Mellancamp and be race appropriate. Finally, my wife came back with Lemonade, by Chris Rice. That is so her. A reminder of a blessed life and encouragement to not be satisfied with lemons. Hope to hear from some of you soon. A running playlist favorite of mine is Charlie Daniels Band "The Devil Went Down to Georgia." Yes - Charlie Daniels and RunEatNapDrink (a very good blog, by the way) will be running Chicago! Thanks!